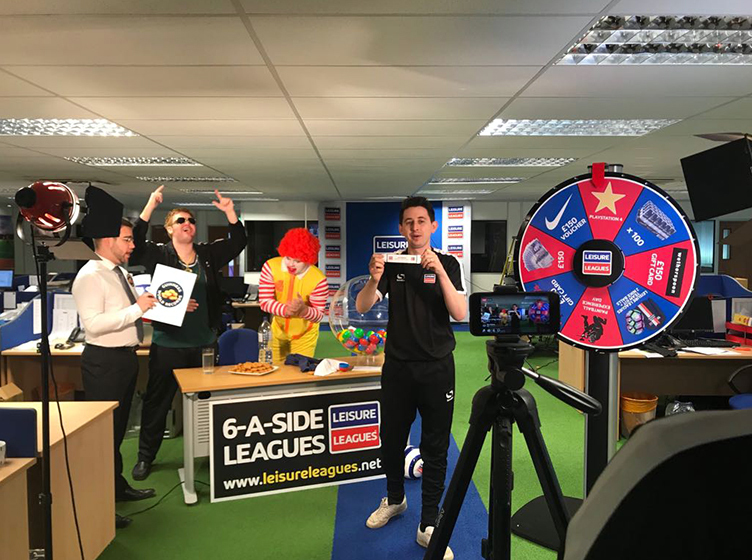 The Leisure Leagues prize draw took place again this morning – with the May edition providing thrills, spills, competitions and prizes galore. As before there were four draws, the first one for the bottom of the league teams, saw Coupla Sharon’s from Cheshunt pulled out from the bowl for a spin of the wheel. The fickle finger of fate saw them land on an S Club 7 album. The rest of the draw continued to hit the right notes too. Curtis Bradshaw, from Netsix And Chill in Weston-Super-Mare took the MVP honours, and after the wheel went round 24 cans of Stella Artois will be staggering their way to the South West. The third set of balls saw Tilton Rifles from the Birmingham league picked out for the runners-up prize and winning £150 to be shared between the squad – but as the boys are Birmingham supporters they might have not been too amused to be drawn out by former Blues player turned pundit Robbie Savage. The final set of balls went into the bowl for the league winners and with an array of wonderful prizes on offer -up to the star turn of the trip to Germany for a Bundesliga game, courtesy of Uhlsport – anticipation began to build. 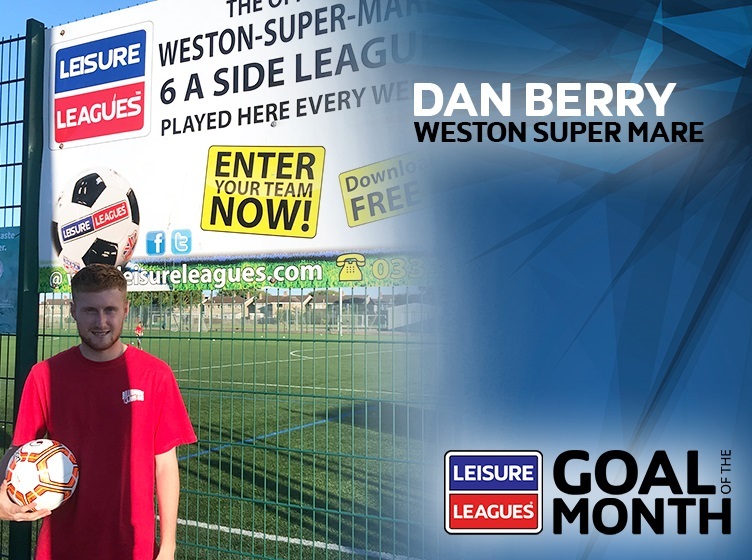 Blood, Sweat And Beers were picked out by Tom, before one of Leisure Leagues Area Managers, Shaun, span to see what the Burton based boys would win. The wheel eventually landed on £500 of Nike Vouchers. 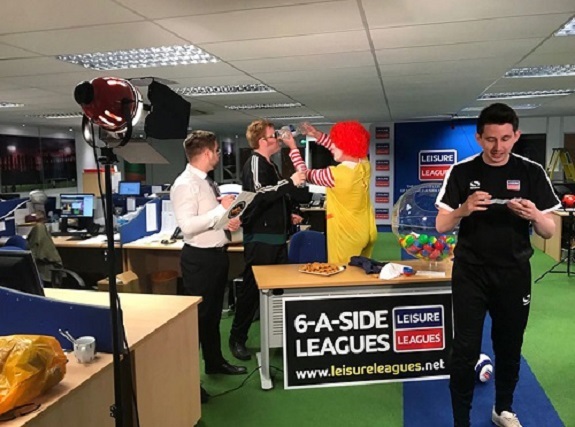 Meanwhile, back at the chicken challenge, Phil continued to just do it himself and eventually finished on a finger lickin’ good 69 nuggets, a number guessed by a number of our Facebook live watchers, with the lucky Kay Blackmore winning the tickets to Non-League finals day. Following the inaugural live event in April, this was draw to see the watching audience in part of the fun too, as well as the lucky teams. So, as well as Non-League Finals tickets, we also had four to give away for the Under 17 Championship final. The challenge to win these was to guess which one of the crew Tom would hit with the ball. 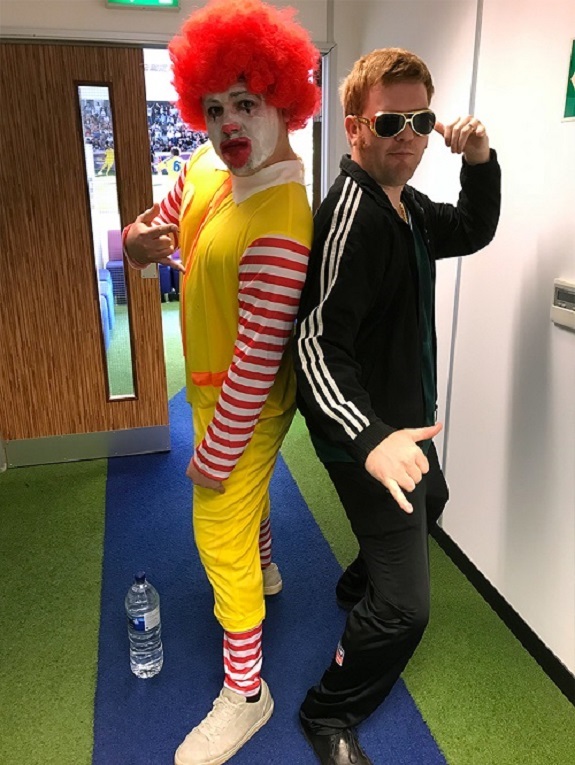 In the end it was Robbie Savage – proving to be a good sport – who got the red arse and Dexter Collins who got the passes. 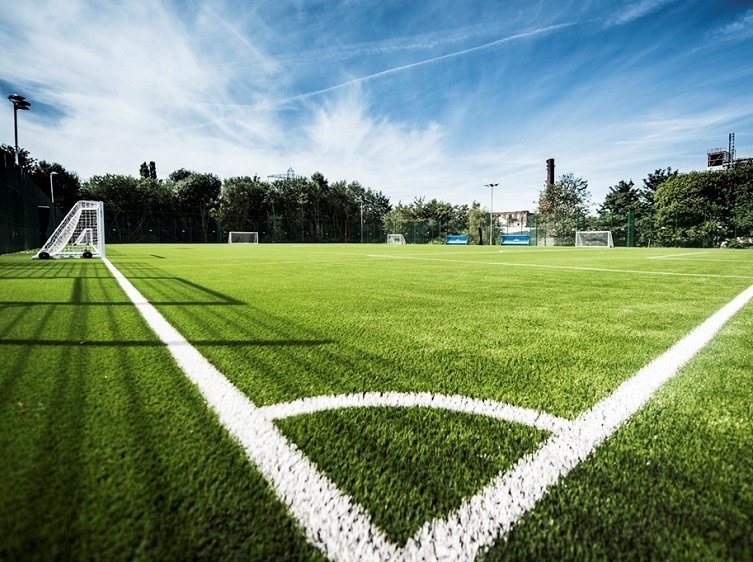 The next prize draw take place on June 5th and will see the winners, runners-up, bottom of the league teams and MVP’s in May in with a shout. Remember, the only way to be going to Germany with your mates is to be in the winners draw, so select the prize draw when your league manager calls at the end of the season. And there will be more spot prizes for the fans too, so make sure you are watching on 5th June.